It didn’t take long for Carmine’s to become one of my favorite restaurants even though it isn’t in Baltimore. It was a trip to the Tropicana Hotel in Atlantic City, N.J., about five years ago that started it. A group of us were deciding where to eat when we happen to pass Carmine’s in an area known as “The Quarter” in that hotel. Since we all agreed we like Italian food, we decided to go, despite none of us having previously eaten at Carmine’s. The restaurant is big: We were told it seats about 550 on two levels. We took our seats and were instructed we would find the menus written in large letters on the walls. So up comes the server and we begin to order. “Do you realize this is family style eating which here means very large portions,” he continued. “For the five of you, I recommend maybe three entrees and maybe two salads. One of the bigger eaters at the table asked if that would be enough. He assured us it would – and he was right. We even had food left over. And for that gang of eaters, three of them could seriously use a sustained diet, that was a surprise. Unfortunately, we were heading home that day and since it was summer we didn’t think the food would last for three hours. So the question became: what do we do with the food? We figured the casino dealers wouldn’t trade it for chips, so we decided to give it to two of the guys who push those pedestrian three wheel cars on the boardwalk. So that was my initial introduction to Carmine’s. Since that day, I have been back to the Atlantic City location four times and have also visited their location in Washington, which is near the Verizon Center. But let me tell you just a few things about the Atlantic City location. Reservations are a good idea just about anytime, but especially on weekends and holidays. When you finish ordering take a stroll around the place, both levels, and check out all the photos on the wall. I make it a quiz to see how many of the people I recognize. Sinatra is obvious, but many of the rest are not, at least to me. There is a bar with TV’s that’s popular. During my last visit it was quite active as the patrons were watching NFL football. 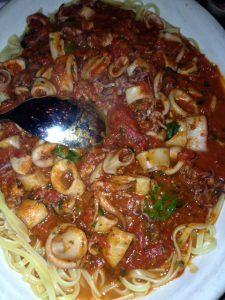 While Italian is certainly why people come here, there are other menu items available like the chicken wings, rack of lamb, prime rib, porterhouse steak, veal chop and salad. In case you want to know, four popular items are indeed the chicken wings, meat balls, penna alla vodka and chicken parmigiana. For dessert, if you can possibly eat it after the feast, try the Titanic Split x 10. I’ve never seen it but am told it is a monster. Other dessert options include the chocolate torta, bread pudding, Italian cheesecake and the strawberry shortcake. If you can eat any dessert after the meal, you deserve a star in the glutton hall of fame. 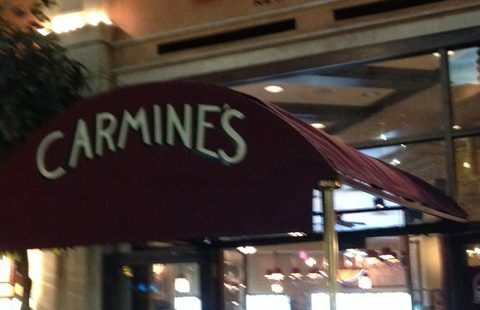 Carmine’s offers a gluten free menu for those in need. All the locations are privately owned. You can reach Carmine’s A.C. at 609-572-9300 or by going to carminesnyc.com.